Healing is not just one method. It varies greatly just as how one person experiences pain differently from another. 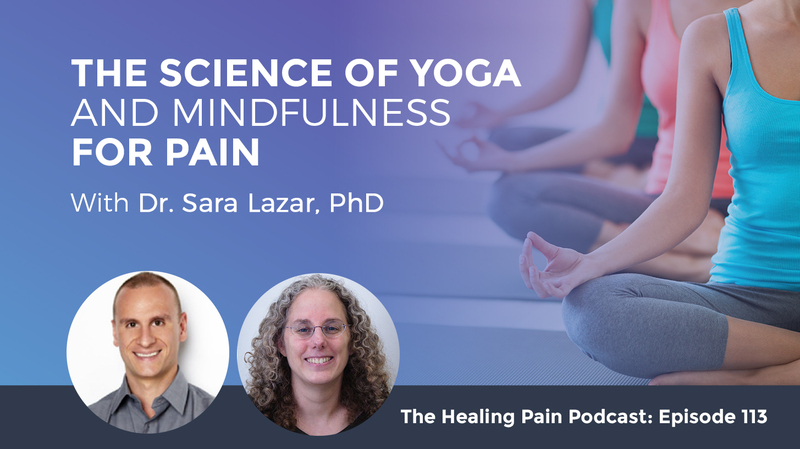 Piecing out neuroscience together with the science of yoga and mindfulness for the relief of chronic pain is Dr. Sara W. Lazar, PhD. She is an author, associate researcher in the Psychiatry Department at Massachusetts General Hospital, and an assistant professor in Psychology at Harvard Medical School. With her background, Sara leads us deep into the discussion about how mindfulness and yoga changes the structure of the brain – how they help decrease pain catastrophizing and pain interference. She shares some great techniques on meditation that can benefit and alleviate chronic pain and even help slow the aging process. Sara also weighs in on yoga versus mindfulness versus the combination of both. We are talking about the neuroscience that supports yoga therapy and mindfulness for the relief of chronic pain. Joining me is Dr. Sara Lazar, who is an associate researcher in the Psychiatry Department at Massachusetts General Hospital, as well as an assistant professor in psychology at Harvard Medical School. The focus of her research is to explore the neural mechanisms underlying the beneficial effects of yoga and meditation both in the clinical setting as well as in healthy individuals. She is a contributing author to Meditation and Psychotherapy and her research has been covered by numerous news outlets including The New York Times, USA Today, CNN, as well as WebMD. On this episode, you will learn how mindfulness changes the structure of the brain. How mindfulness, as well as yoga, can help with decreasing pain catastrophizing as well as pain interference. How many minutes of meditation do you need each day to reap a benefit? Does the scientific evidence support that mindfulness can truly alleviate chronic pain? Which is better for pain, yoga or mindfulness or is a combination best? Finally, how can mindfulness help slow the aging process? This is a great episode. If you are a practitioner and you’re interested in the neuroscience behind mindfulness or if you’re someone with chronic pain and you’d like to possibly explore mindfulness or yoga for your own therapy. 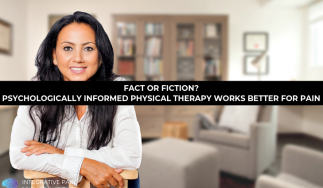 If you’re a practitioner and you’re interested in this topic, make sure you hop over to the IntegrativePainScienceInstitute.com. There are lots of great blogs there around mindfulness and cognitive strategies to help with chronic pain. Sara, welcome to the show. It’s great to have you here. I’m excited to have a neuroscientist on who studies yoga and meditation. I think it’s an area we need to do more research in, to discover mechanisms as well as the clinical applications for both of those treatments. Tell us how as a neuroscientist you became interested in studying yoga and meditation. Basically, it’s out of personal interest. Back when I was in graduate school, I did not think very highly of yoga and meditation. At that point, if you said yoga and meditation, I equated that with tin-foil hats and magic crystals and pyramids and whatnot. I was skeptical about it. Then a friend and I decided to train for the Boston Marathon and I overtrained and I destroyed my knee and my lower back. I went to see physical therapists and they said that I have to stop running and just stretch. I didn’t like aerobics classes and so I’m just stretching because I wanted to stay in shape. As I was leaving the physical therapist’s office, I happened to notice an ad for a vigorous yoga class that promises to promote strength and flexibility, but also cardiovascular endurance. I thought this will be great with just the stretch and stay in shape, and then maybe I could still run on the marathon. During your PhD, did you know that you’re going to start to venture into that area? Just in the very end of my PhD. I was pretty much done with my PhD when this all happened. I thought about it and I said, “Can I really do this?” It just worked out. I got very lucky. It’s almost like a little career change at the last minute there. We talked a lot about the brain and pain on this show. When we talk about mindfulness, maybe first, what types of effects do you see that mindfulness has on the brain? We have done a lot with brain structure. We have shown both in long-term meditation practitioners and novices that there are differences in brain structure. By that what we mean is we took people who never ever practice meditation before, we randomized them to either go through meditation or go through a weightless control. What we saw is that the people who went through the meditation program had an actual increase in gray matter in their brain in certain brain regions, compared to the controls who didn’t go to the program. A lot of people are like, “This is amazing.” It’s well-known that if you train someone to do something new, their brain will change. The fact that the brain is changing was not necessarily Earth-shattering other than most people thought that meditation, you’re sitting there and you’re not doing anything. That’s validation for them that meditation is actually something active. What we were interested in is where it changed. The important clues as to what’s happening during meditation. The areas that we saw changing, one was the hippocampus, which is an area of learning and memory. One is the PCC which has to do with self-reference and how this is relevant to me. Another region is down in the brainstem and it’s an area involved in releasing neurotransmitters. We saw that the change in that region correlated with well-being. People reported being happier if that region changed. Then the last region we found was the amygdala, it got smaller. The amygdala is all about fight or flight and fear and stress. As that got smaller, people reported less stress. These changes are consistent with the self-report and what people are talking about and how it’s impacting them. The fact that the amygdala has shrunk is so interesting. People talk about the amygdala as the harm alarm. The alarm that turns on pain and it is obviously very involved in stress. You saw that shrink, which I think is fascinating. The learning aspect also, when we talk about learning and memory because chronic pain oftentimes is spoken as a learned phenomenon. The brain learns how to create pain and the more repeats the patterns, the better it gets. You saw that meditation targeted the learning aspects of the brain. The hippocampus got bigger. We know that with chronic stress, the hippocampus gets smaller. How that would impact pain is a good question. The idea of the patterns, that’s interesting, I didn’t know that. That I think is consistent with how we know or how we think mindfulness works with pain. You mentioned the temporoparietal junction, which is above your ear a little bit. That part of the brain helps you take perspective. You notice gray matter increase in there as well. That’s a big part of empathy and compassion and seeing things from other points of view and creativity as well. We think that could have people thinking about things in new ways. When you’re conducting studies, are you looking at a particular type of mindfulness intervention? Is it just MBSR? Oftentimes when research is done, to try to keep things tight and neat, you pick just like eight sessions or a certain technique. Is there one that you study more than others? We mostly do MBSR. MBSR was the original mindfulness program developed by Jon Kabat-Zinn. That’s the most basic generic mindfulness program up there. There have been other ones that develop specifically for depression and for anxiety and eating disorders and addictions and all sorts of different conditions. Most of our data, because most of our students have been with helping normal people, they’re distressed so mostly we use MBSR. We’ve done a few studies with anxiety disorders. Actually, one study with pain and people with comorbid depression and pain. The brain data has not yet been analyzed and published, but the behavior data has been. 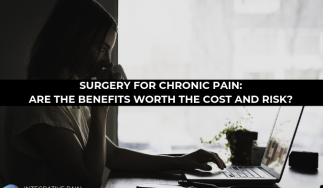 It demonstrated that it was indeed effective for people with chronic pain. The brain learns how to create pain, and the more it repeats the patterns, the better it gets. Mindfulness is effective. When you say effective, we can start to break that down to what that means effective but I guess people want to know does mindfulness produce pain relief? We actually did a med analysis. In terms of actual pain sensations, I say the data is mixed. Some studies find a modest decrease in reported pain. Others find no change whatsoever, but even the studies that find no change in reported pain, find decreases in things like pain catastrophizing and pain control. 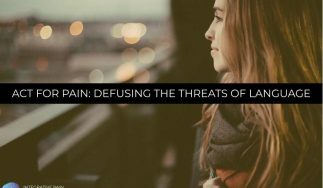 Basically, the idea is how much is the pain control in my life and how much is the pain impacting me? How much do I avoid doing things to avoid the pain? That’s where mindfulness makes a big impact very consistently. It was more about the relationship to the pain. That’s very consistent how we know or how we theorize mindfulness is working and how mindfulness is taught, which is the idea is because that’s more about your thoughts and your thinking. Mindfulness is all about seeing mental habits and getting a perspective on your mental habits and so stepping back from your mental habits. The analogy I like to make is that you see your friend and you know all your friends’ bad habits. We all know our friends’ bad habits, but they don’t see them. We’re blind to our own bad habits. With mindfulness, what starts to happen is you start to step back and you start to see your actions and your thoughts from a third person. Suddenly you start seeing all your bad habits and all your habits in general, including the, “I can’t go out because it’s going to hurt too much,” and you see, “That’s just a thought. That’s silly.” Just as you would say to your friend, “You don’t need to think that. That’s not right.” You see that for yourself and you realize that you don’t need to hold on to those thoughts anymore. You also study yoga. Yoga has a mindfulness component to it at times, depending on how you teach it and obviously, it has a physical component to it. Are you studying yoga as just a physical form of exercise or is it more from a mindfulness perspective? Definitely more from the mindfulness perspective. MBSR includes both yoga and meditation. It’s a very slow and gentle form of yoga. The studies that we have done so far with yoga have always been with a slower and gentle form of yoga because the emphasis is the mindful awareness because that’s important. A lot of times some of these power yogas, I don’t think it’s really yoga. You can have fast yoga that is mindful and really mind-body but sometimes when I get the jam, these teachers, it’s just exercise. They’re using yoga postures but it’s not yoga. I try to avoid the power yoga classes. I took the slow and gentle stuff that’s usually a little bit more mindful. Is there a certain style of yoga that you have focused on in your research? For the most part, we use something called Kripalu. The word Kripalu means compassion in action. It’s very mindful and they have something they call witness consciousness, which is basically the same idea as mindfulness. It’s this idea that there is this part of your mind that observes in a detached way so that’s very consistent with mindfulness. That observer self is existing when you’re meditating, but it’s also existing when you’re moving and doing yoga for instance. It’s not like, “I need to get into this posture.” It’s like, “What am I feeling as I raise my arms over my head?” It’s keeping at the moment and stepping back and keeping an eye on everything. There are people in two camps that would love to hear this. Have you looked at yoga versus meditation? A little bit. We have two studies that are published where we compared long-term meditation practitioners to long-term yoga practitioners. These are people who mostly practice Kripalu yoga versus people who mostly practice mindfulness meditation. What we saw is that for the most part, things were the same. There were some subtle differences, but mostly they were the same. We have a new study though which is not yet published, where we took novices and we randomized them either mindfulness or yoga. They look different. There’s a great quote which I love, “There are many paths up the mountain but there’s only one mountain.” The idea is that if you’re going up a mountain, if you start on the North face versus the South face, the bottom of the hill, things are going to look different. The closer you get to the top, the more they looked the same. We think the same is true because when you talk to advanced practitioners of the different traditions, what they talk about is very similar. There are some differences, but most of them are the same about what enlightenment is and whatnot. Yoga looks very different from meditation. That’s what we think is that there are some differences at the lower levels, but then in the higher, you get the most from under. You’re talking about from the perspective of what you’re seeing in the brain on like a functional MRI, but not looking at the quality of life factors. No, because those are pretty similar. We actually have another one where we compared two different types of meditation. One was your mindfulness and the other one was a mantra-based, relaxation-based meditation. Even there we saw some differences in the brain. Both were good at reducing stress, both reduced a lot of the symptoms and whatnot, but the brains looked different. There were some things that are different in terms of the questionnaires, the questionnaires were different. There are similarities and there are differences I’d say. Like for sports analogy, it’s like running versus swimming versus golf. All have general benefits, but they all are going to work with different muscle groups. If there are many ways up the mountain to get to the same place, how long do I need to be climbing the mountain to reap benefits? You can definitely get benefits even after a couple of classes. You and I see this sometimes in my classes for the studies that we do. I don’t teach the classes but I have set up and then talk to people at the beginning. I say, “Welcome to the study,” and then I go away and then come back at the end. At the beginning they were all stressed out, at the end of the first class, they were looking so relaxed and so happy. That makes me happy to see that change. People do say that after a few weeks, they start to notice the impact in their life. It’s like exercise, the more you do it, the more you’re going to benefit. If you get into it, you’re going to turn into like an Olympic athlete of meditation. Certainly, if you just practice every day for 20, 30, 40 minutes, you can get in a pretty good mental shape. There are many paths up the mountain but there’s only one mountain. It sounds like twenty minutes is the number you hover around most. We are trying to do 40. It depends on the different traditions and different teachers, but generally speaking, 20 to 40 is generally recommended. The science is backing up and saying if you practice for about twenty minutes a day, you’ll see the benefits there. Here’s another question which I’ve always concerned about, do the benefits stay? Let’s say I take an eight-week MBSR training, where I go to the clinic for two hours once a week. Then at home, I’m meditating for 30 minutes. When that ends, let’s say I decide that I’m going to do meditation twice a week for twenty minutes only. Do the benefits within that eight-week time stick or do I have to continue the exact same frequency duration for it to continue? No one’s done that study well yet. No one’s looked to that carefully, but I can tell you from my own experience just talking to other people. It’s like back in school, you go and you learn math. In the class, if you stopped doing algebra, you start remembering but not completely. If you go back to it, it takes you a while but then you get it back. There are some bits and pieces that do stick with you. For instance, two plus two, here it is 40 years later, you remember two plus two even though you’re not doing it all the time. I would say that once you step back and you see your bad habits, you’ve seen it and you can’t unsee that. If you keep practicing, you’ll continue to see more and more of your bad habits and more and more subtleties of your mind and how it works. If you stop practicing, you’ll probably stop getting those insights and awareness. If you just practice like twice a week for twenty minutes, you probably still get a little bit of benefit but not as much. Like exercising, if you exercise every day versus exercise once a week, it’s similar. It’s almost like the use it or lose it phenomena. There are definitely some things that even years later you still know how to ride a bike even if you hadn’t ridden a bike in twenty years. There are some things that are still there. Looking at your research going forward, what are the areas that you’re going to start to explore that you’d like to explore in the mindfulness yoga realm the hasn’t been discovered on Earth yet? Most of the brain imaging studies have just been pre-post, just eight weeks and we get at the question you just brought out. We’re now doing a study where we’re looking at people one year later. Just trying to get at people who continued practicing versus people who stopped. The other thing we’re doing is we’re looking at older people because there’s quite a bit of data that suggests that meditation helps preserve the brain and the body with aging. We’re looking to see, “Can we actually slow down aging?” Those are the two big things that we’re doing right now. Then getting at some of these other changes in the brain. We’re trying to understand more completely. Looking to see the hippocampus, how is it impacting memory? How is it impacting emotional relation? How is it impacting these different things that it does? We’re trying to drill down a little deeper into some of these changes. The fact of looking at meditation on aging, cognitive decline is so important right now. I’m not sure there’s a lab that’s honing in on that one aspect of it, but it’s really important because some of the gray matter changes that you’ve seen with pain. I’d be curious to see if there are similar changes that happen with the aging brain, so to speak. We know the hippocampus definitely goes with age and also the PCC, that’s with the Alzheimer’s disease. Those are the two main regions that go with Alzheimer’s. We aren’t looking at Dementia yet and Alzheimer’s, but that’s something new we’d like to do in the future. Right now, we’re just looking at healthy aging for the most part because we all get old no matter what. That’s of widespread interest. As a neuroscientist who studied yoga and meditation, can you share with us what your personal practice is? My practice is variable, I hate to admit it. I am never been one for a set routine. I aim for 40 minutes a day. I go to a meditation class once a week and I go to yoga classes twice a week. Those are pretty set. Then during the rest of the week, I practice anywhere from 5 to 40 minutes a day, there’s no real pattern to it. Some days it’s five minutes, some days it’s 40 minutes. I try to most days do at least five minutes and then I try to do 30 or 40 at least two or three times a week. There are definitely periods where I’m practicing way more than that, 30 or 40 minutes all the time. It’s a great schedule, the fact that there’s variety, it’s actually at times beneficial for the brain because you’re giving a new input, new stimuli, new sensation, which helps the brain grow with that positive plasticity. The main thing is just trying to make an effort to do something every day. Some days it works out well and some days not so much. Once you step back and see your bad habits, you can’t unsee them. One of the things that people do as they start to dive into the meditation and yoga world is they’ll go on retreats. They’ll go on three days, five days, one week, two weeks, some of them are actually three months long. Have you done any research on some of the longer retreats for people and what happens obviously in the brain? We have not but other people have. Not with MRI but with EEG and they’ve definitely shown big changes in the brain, which makes a lot of sense. Even just one day, there are a couple of papers about people who even just one full day in meditation can have a big impact on brain function. This work is so important. There’s not a lot of money in emphasis going into this because unfortunately in our world, a lot of money goes towards pharmaceutical. That’s where a lot of the funding can go but the funding for your studies, most of them focuses on functional MRI funding. Is that correct? Correct. There’s definitely MRI, yes. Then there’s also just a lot of its clinical outcome. Mindfulness with disease and mindfulness without disease. It’s also important why people support the NIH because a lot of your funding comes through there, which is important. That’s a good thing to mention. Sara, it’s been great chatting with you about mindfulness and yoga and the effects on the brain and neuroplasticity. Can you tell everyone how they can learn more about you? I have a website and we have links to all my papers there and there’s also some information about how to find resources. If you just Google my name and Harvard and meditation, you should be able to find me. Also, we have a Facebook page and we have a little bit of information on that and every time we have a new article comes out, we post on Facebook. What’s the name of the Facebook page? Lazar Lab For Meditation Research. The website if you’re interested, you can find it on the page, https://Scholar.Harvard.edu/Sara_Lazar. I want to thank Sara for being with us and giving us a little up-to-date information on the neuroscience behind yoga and mindfulness. It’s super important for those with chronic and practitioners learning. This is important information, so make sure to share it out with your friends and family. Hop onto the website at DrJoeTatta.com, make sure you sign up for the podcast so I can send you the latest update each week and make sure you hit the like buttons so you can share this out with your friends and family on social media. It’s been great chatting with Sara. We’ll see you in the next episode.